Mattawa fight fans roared with delight as hometown favourite Justin ‘King’ Condie took down a provincial champion in the Quest for the Voyageur Title 5 co-main event, Saturday. Condie, 27, rocked Todd Elvrum of Timmins TMAC with right and left bombs to earn a technical knockout in the third round, Team Action’s first win of the day in the nine-bout World Kickboxing Federation sanctioned muay thai event. It was a huge win. Elvrum, 24, had just heard this week the WKF picked him as Team Ontario’s 175-pound contender heading to Italy in November for the world championships. He had won a provincial title fight last month against Rocky Huynh of Guelph. Condie’s victory whipped the 450 souls in a sweltering Mike Rodden Arena into a frenzied lather. And they were glued to the edge of their seats as North Bay’s Josh Beaton and pro prospect Jeff Brown of DOHJO Peterborough put on a superb five-round show of skill and power. Perfectly matched in size, reach and experience, the main event fighters mirrored each other’s kicks and blows, although Brown jumped out to take the first round using an intense leg attack. Beaton, 26, switched to southpaw and then cranked it up to win the second, while rounds three through five could have gone either way. Beaton, however, appeared to have more stamina and energized the crowd with a spinning elbow attempt and several front kicks that may have turned the tide his way. 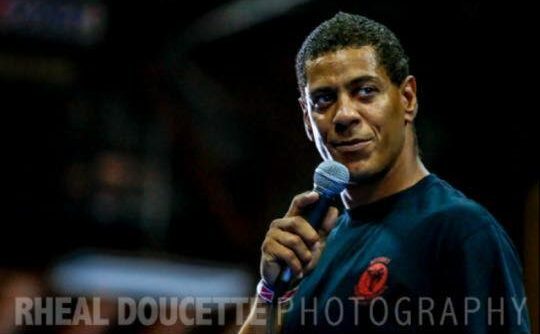 “Josh really needed that win,” said Corey Jackson, emcee and organizer of the Action’s School of Fitness fifth-annual gathering during Mattawa Voyageur Days. Beaton credited his corner-man Jay Davies of Loyalist MMA in Belleville for helping him get the losing monkey of his back after a couple hard defeats in a row. “Jay broke it down for me, got me to change my stance,” Beaton said, reflecting on the battle, the Peterborough fighter was picking apart his lead leg. 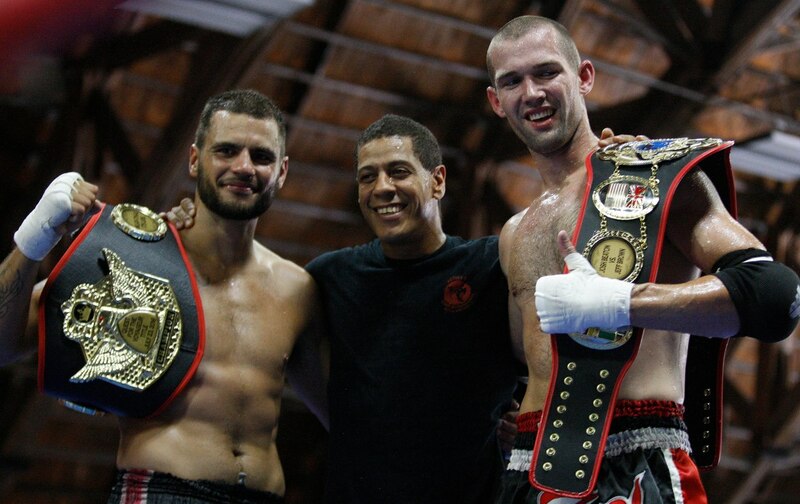 Condie appreciated the magnitude of his winning the Quest Title belt after getting stopped in the third round last year (although it was his second bout of the day against a fresher foe). “To go in against an athlete like Todd Elvrum and TKO him in front of my home crowd like that was a feeling words can’t even begin to explain,” Condie told The Nugget. “He was a tough test coming off a provincial championship win and being selected to represent Team Canada in Italy. Condie was also happy for Beaton to win his Quest Title match right afterward. “Winning alongside my training partner Josh Beaton, who put on an amazing display of technique, skill and heart, was a great moment and huge accomplishment for us and the club. 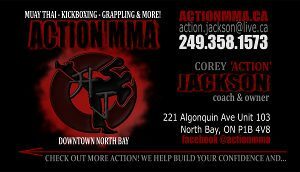 Team Action’s veteran Troy Clarke gave up several inches in height and reach to fight Maurice Pompey of Pound 4 Pound of Pickering in the 135-lb senior K1 class. Clarke ducked and slipped the long legs several times and threatened with looping rights and lefts, although Pompey scored consistently for the unanimous decision. Leah Hardy did well in her first fight against a more experienced opponent, Rebecca Contrino, from Montreal’s Titans Academy. Hardy showed she was tough and determined in the 150-pound bout by getting off the mat twice in three rounds, but the more polished Contrino was in control from the outset. Nick Caruso got a taste of the sport in his first fight against Shawn Donaldson of Sudbury BJJ and MT. Head gear problems interrupted the pace of his 145-lb match, although his opponent was clearly determined to get a knock-out win. Caruso launched his own flourish, but Donaldson returned with fists and knees flying and the Team Action towel was thrown in as their fighter was taking too many blows. Mattawa’s Albert Belanger was stopped by the ring-side doctor at the end of the third round after he wobbled on the ropes following a barrage of knees and elbows by heavyweight David Melbeuf of Ottawa’s OAMA. In other action on the nine-bout card, Evan Grice of Kitchener’s Darkside MT connected on a right cross to stop Ottawa’s Rahul Rallan in the second round of their 150-lb muay thai fight. Mark Ramawad of P4P Pickering used is height and reach advantage to out-point Sudbury MMA’s Nick Luong for a unanimous decision in their junior male 135-pound fight. Luong was bloodied yet game and gave a good show. Martin Plouffe of TMAC Timmins and Eric Samtleben of Peterborough had a great 155-lb fight with both combatants giving all they had. But Plouffe proved more efficient with kicks and earned the decision.